Back in 2004 I discovered the very first piece of evidence pointing to what I hoped would turn out be a Bronze Age habitation site. I was extremely lucky to stumble across such a scrap in the first place, working as I was in total ignorance of anything to suggest it might be there. 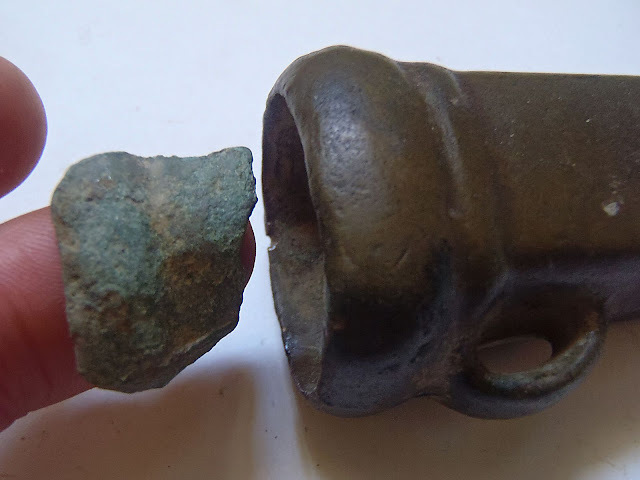 There were no records of Bronze Age activity anywhere nearby except for a single instance of a hoard of axes found four miles away and up till that point I'd never found so much of a fragment of a recognisable bronze item to suggest there ever had been. The find was a single piece of pottery. Such sherds look like the chunks of dried mud mixed with trodden-in grit that fall from the tread of your wellies. Even in the hand and recognised for what they really are, they still appear to be made of the same soil that you've been searching, therefore they're almost impossible to spot against it. However, spot it I did, but only because I had prior knowledge of what it looked like. In 1990, and just a few months after starting detecting, I'd discovered a small hoard of two socketed axes and along with them were found two body sherds of locally made flint-tempered pottery. So, I understood full well what small pieces of broken common or garden bronze age pottery vessels looked like, and was therefore able to 'see' them at very short range, but quite how I managed to see that first piece when I was not looking for it, I have no idea. So, I commenced a painstaking search of the immediate area and eventually found another piece of the same stuff. The detector was in play throughout, but it failed to find anything that could be said to be contemporary with the pottery. Hours later, I was exhausted by the exercise but had found a further sherd some distance from the first two. I realised then just how very sparse prehistoric sites really are! Daunted by the incredibly thin pickings, but spurred on by the knowledge that I might have discovered something important, I commenced session two. This time I was determined to find metalwork amongst the pottery even if were only a tiny scrap of a thing — so long as it was certainly 'period' then I'd be happy. Prepared for a long hard day, I set off to walk up and down the guide lines made by the rotovator for just as long as it would take, but I found no metal I could say was Bronze Age all day long. A third session was made the very next day. I had begun to think I was wasting my time and that metal find I needed so badly probably wouldn't come, was prepared to give the job till lunchtime and then reassess my position, but it turned up on just the second pass! 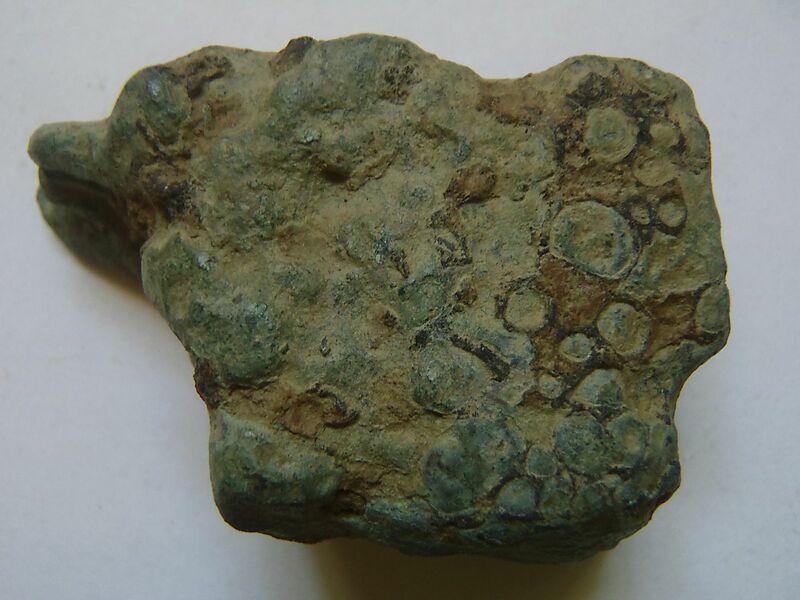 It was a piece of copper 'bun ingot' and proof positive that metalwork contemporary with the pottery was there after all. Such an innocuous piece of metal surely never made a detectorist so happy — you'd have thought I'd found a gold noble! I was beside myself with excitement and punching the air, not because it was valuable or even especially rare, but because it was so hard-earned and was absolutely crucial to the future of the site. The day after I worked very hard indeed and was on site for the best part of eight hours, but in all that time I'd found a only a few extra pieces of pottery and a handful of possible flints. The evidence was extremely thin and well spread but I felt it was worthwhile continuing and I'm ever glad I did, because in the last hour I finally turned up an exciting metal item — the tip of a bronze spearhead. 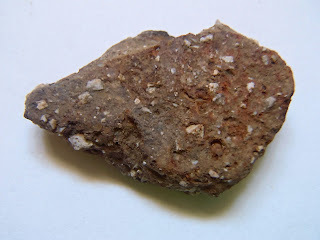 Further investigations included a hunt for flints. 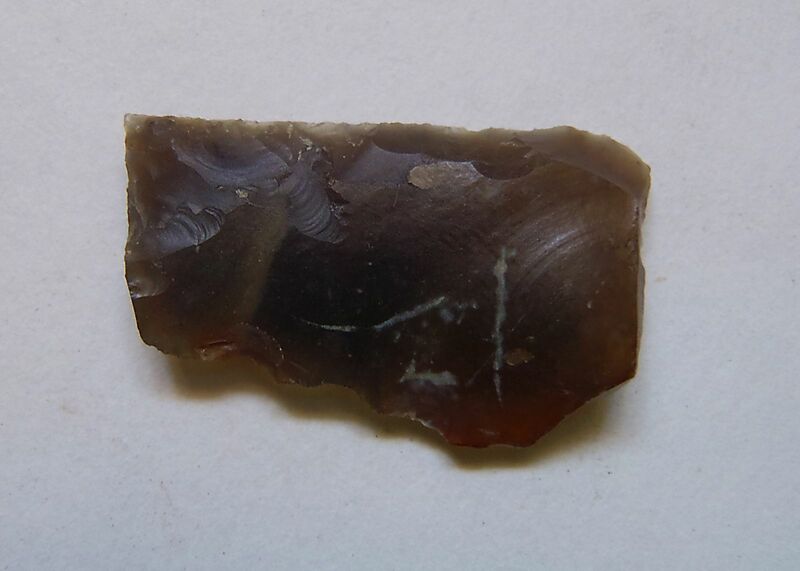 I found just one identifiable tool — a broken knife blade — but quite a bit of worked flint, and taken altogether with the pottery and metal finds, the assemblage so far collected was fast becoming enough to establish the site as something very unusual and interesting. Over successive trips, and a total of 60 hours of very hard and demanding work, I turned up a few more bits and pieces of unidentifiable bronze, a cast bronze pin head, a complete but very small bun ingot, and a fragment of the mouth of a socketed axe which compared exactly with those complete ones in my collection — South-eastern types, and common to Essex. 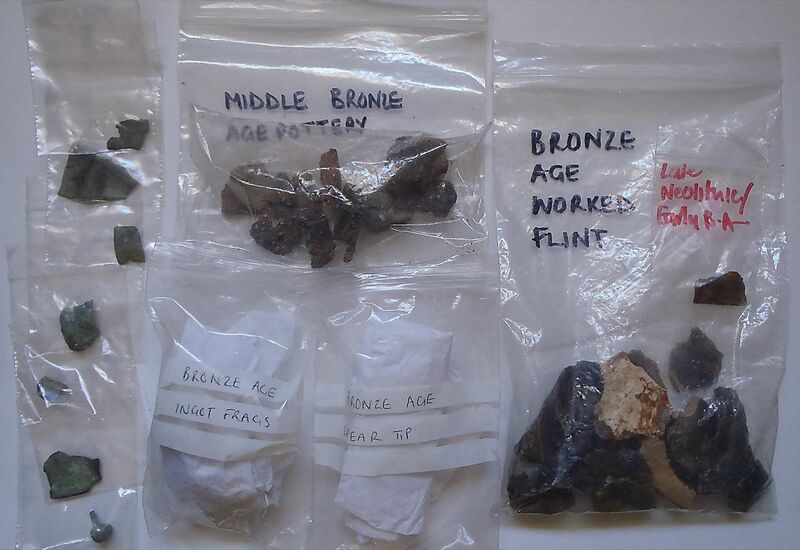 By the time the crop was sown, I'd amassed a persuasive collection of finds that together were more than enough to make anyone interested in the Bronze Age, sit up and take notice. 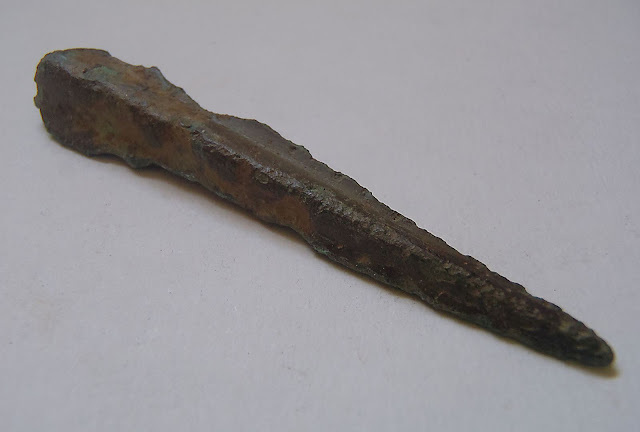 Rarely are finds of metalwork made within scatters of Bronze Age pottery and worked flint. Usually a field walker would discover a scatter of pottery and worked flint without metalwork, or a detectorist might discover a hoard of metalwork or metalworking evidence but without associated flints or pottery. Archeologists have always remarked upon this phenomena when excavating Bronze Age sites where metalwork finds are meagre to non-existent. However, I'd discovered not only pieces of metalworking scrap and bronze ingot, but worked flint, flint tools and pottery sherds too, all spread together over a localised area of a single field. I thought the effort had more than paid off, because scanty though the evidence was, it seemed to be pointing toward long-term occupation with metalworking industry 'on site' and away from the long-held academic notion of itinerant smiths wandering the country, setting up temporary camps near to occupations sites, where they'd chop down trees, make fires, and cast tools and weapons to sell to the residents. In short, I'd begun to think I'd proof of the first known Bronze Age factory, which may seem an extraordinary claim to make for such a meagre collection of finds but in the field, and without pause for thought, such ideas are bound to create themselves. It's human nature to speculate, after all. When the field was drilled and out of bounds, I went off and searched for 'easier' prospects elsewhere on the farm. A new Bronze Age site was established beyond doubt but I intended to return the following year just to consolidate things. However, despite my pet theories, a month later I'd already begun to kerb my enthusiasm for them because what the site could be or what it could mean were things I'd decided were impossible to ascertain for sure without some kind of 'extra' evidence. But I'd no clear idea what that might be or how I could go about finding it. I think I have found a BA fragment and some waste product too....hard to tell though.. It is hard to tell, Dominic. You need so much material to prove anything and it's so very sparse. Let me have you blog address and I'll take a look and put the blog on the sidebar too.